Soloist, vocal coach and Accompanist for Pasadena Pro Musica. Employed part time by California Philharmonic, Caltech, and Pasadena Pro Musica. Faculty of Music, Humboldt State University (faculty associate). Director of Humboldt State University annual Chamber Music Workshop. Accomplished pianist and singer with extensive professional performance experience. Alan Geier graduated in l975 from Pomona College, where he studied piano with John Steele Ritter, played chamber music with Giora Bernstein, accompanied the Glee Clubs, under William F. Russell, and sang in the Blue & White Barbershop Quartet. He received his Master’s Degree in Human Development from Pacific Oaks College in l978, and for more than 25 years worked as a full-time music teacher for Middle and Upper School students at Polytechnic School in Pasadena. The classes he teaches include: Music Appreciation, Chamber Music, Musical Theater, Choral Singing, and Music History. In l986-87, as a recipient of the Dudley Wright Grant, he spent a year making music and studying German in Vienna, Austria. Among other activities there, he performed with the Wiener Jeunesse Chor under Gunther Theuring, and hosted international chamber music sessions in his apartment. For many years Alan was the Piano Coach for the Adult Chamber Music Workshops at Humboldt State University, where he is on the Music Faculty as a Faculty Associate, and this summer will mark his 5th year as Director of the Workshop. 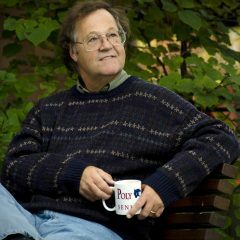 Alan is active as a freelance pianist and singer in Southern California, including work with the Donald Brinegar Singers, the California Philharmonic Chorale, Pasadena Pro Musica under Stephen Grimm, the Wagner Ensemble under Jeannine Wagner, and the Caltech Women’s Glee Club under Desiree La Vertu. In October 1997 he soloed with the Claremont Symphony Orchestra, performing Mozart’s Piano Concerto #9 in E flat; in March of 2006 he soloed with Pasadena Pro Musica in Beethoven’s Choral Fantasy. Alan has been fortunate to work with many fine conductors and composers, including Michael Tilson Thomas, Jester Hairston, Rodney Eichenberger, Daniel Pinkham, Roger Wagner, Morten Lauridsen, Frank Ticheli and Eric Whitacre. 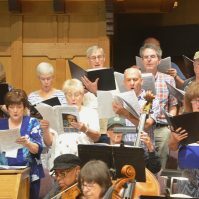 The chorus consists entirely of auditioned, accomplished musicians who volunteer their services from the beginning through the end of each concert season.